On a hot, sticky summer day, I was interviewed for a travel magazine article about traveling to Korea. My contribution was, of course, on the part about Korean food. It was an afternoon of fun chat with Victoria, the writer, and I’ve been anxiously waiting to see how she would put all the pieces together. Now I’m happy to read the article published in the fall issue of Smart Luxury Travel (previously Sherman’s Travel Magazine). It’s a fun, informative article about Korea that covers from food scenes and sites worth visiting to clips of historical/cultural backgrounds. As for my part on shameless self-promotion, here is an excerpt from the article. Deliciousness is just one happy by-product of the philosophy behind Korean cuisine, which holds that the universe, and therefore human bodies and the food they eat, are governed by yin and yang (or, um and yang, in Korea) and it is composed of five elements. Thus, a proper Korean dish harmoniously combines um (greens, fruits, pungent, cold) and yang (roots, meat, spicy, fried) and contains five colors (red, green, yellow, white and black). For the rest of the article about Korean food and other fun stuff about Seoul and more, you can go here. 지난 여름, 한국여행에 관한 잡지기사를 위해 한국음식에 대해 인터뷰를 했습니다. 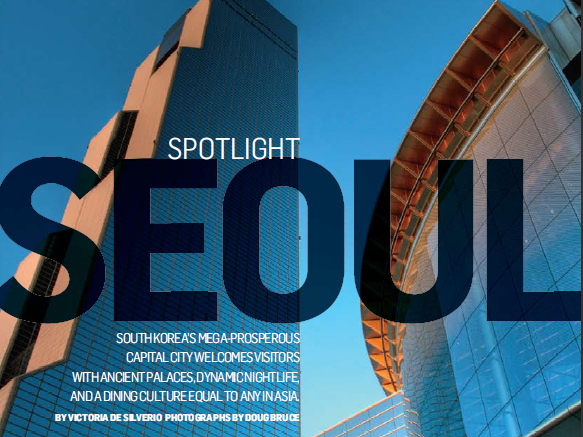 기사가 드디어 미국의 Smart Luxury Travel (previously Sherman’s Travel Magazine) 잡지 가을호에 실려서, 한국음식에 대해 이야기하는 부분의 일부를 번역을 해보았습니다. 우주가, 더불어 인간의 몸과 먹는 음식이 음양에 의해 다스려진다는 한식의 기본철학에 맛은 즐거운 부산물의 하나이다. 오행으로 이루어져있다. 그러므로, 고유의 한국음식은 음 (채소, 과일, 자극적인, 차가운 )과 양(뿌리, 고기, 매운, 튀긴 )을 조화롭게 결합하고, 다섯가지 색(붉은색, 녹색, 황색, 흰색, 검은색)으로 표현된다. 아마 불에 구워먹는 고기만큼 접근하기쉽고 호감이가는 음식은 없을것이다…. 전체 기사를 보시려면 여기를 클릭해주세요.